Last night Patrick went trick-or-treating and got a bucket full of candy! Because of the freak snowstorm that took out our electricity (and therefore heat and water) we are staying with my parents. 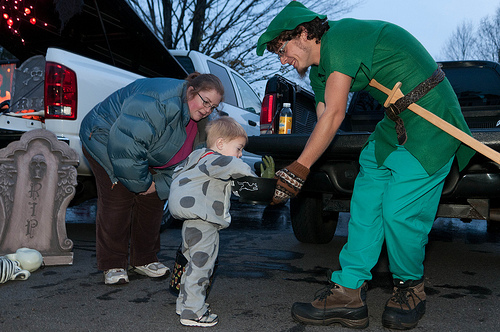 So, we visited the Bozrah Center Congregational Church’s Trunk-n-Treat event. As at the renaissance faire, once Patrick understood that people were giving him candy he was excited about heading off to see what he could get.